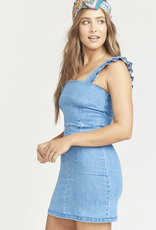 The perfect little denim dress! This dress features ruffle detailing on the straps, as square neckline and a back zip closure. Pair this dress with a pair of sneakers for a casual look, or wedges for a more dressed up look!